Who is your Favorit teacher? Do Du like Mr. Kimura? Is there anyone still active in the Azumanga Daioh Fan Club? I am new to this Club and Anime. And I want there to be active people here to help me get Mehr into this Anime. Plz can Du find episode 3 1/3 (and up) for me? This fanfic was created only Von me. 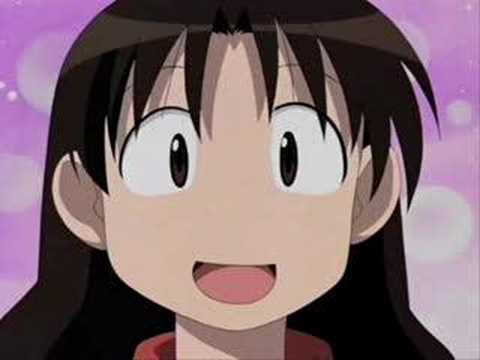 Characters as well as places and elements from Azumanga Daioh belong to its creators. Only my Fan made character is owned Von me. Please enjoy this thrilling and exciting fanfic- as I have worked so hard on it last night. It was a beautiful morning out in the city of Tokyo. As cars and traffic were flowing by, a creature was flying above the streets- admiring the traffic as well as exploring around the city. I have some big news for all of Du out there. After finishing watching the series just today, I have tried coming up with an idea for a fanfic about your Favorit characters on an all new experience like never before. Featuring a very special guest star: my Fan made Anime character, Kasey, this fanfic will be the biggest project I have undertaken so far. I hope it all works and plays off great for Du all. :D I hope Du are as excited as I am. a comment was made to the poll: Who is your Favorit student? a video Wurde hinzugefügt: Azumanga Penguin! what is the name of the hat that the class 2-3 wear during the culture festival?